With WordPress you can build, manage, and maintain amazing websites. Its wide plugin ecosystem gives us extensive amount of functionality. No wonder that it is one of the most influential useful platforms. Our WordPress Maintenance Services East Perth is the most effective way to keep your WordPress site up and running. WordPress provides freedom for users to apply new features and innovations. However, as an open source platform it also gives way of hackers or malicious items. It is necessary that themes and plugins must be up-to-date. Moreover, having proper maintenance will keep your WordPress site function properly and bug- free. As the digital world changes from time to time you also need revamping your business website according to your campaign and brand. You cannot use the same features forever! For clients, it is more appealing to look at to fresh and trendy contents, therefore you must blend with it. For this reason, you must hire WordPress Maintenance Services to perform this task in a well- defined manner. The priority for having a website is the browsing experience of your visitors. Therefore, it is necessary that your WordPress site must be accessible to your customers. Of course nobody wants a site that shows consistent error. If this kind of problem persists then a tendency that you will lose your search engine presence and potential customers. A website is build up with different components. So, it is necessary that you will hire professionals. WordPress Maintenance Services East Perth to solve all these issues. Everybody wants a functional and swift browsing! We use systems that regularly monitor all plugins for any available updates and vulnerabilities. We can detect immediately when update is available and carefully check each one before it is installed to your websites. This action ensures that your website remain running swiftly. WordPress never gets tired to progress and evolve. Constantly, there are new add-on features and the old ones are being removed. Our systems monitor all updates to ensure that your website is always up-to-date. Our engineer and WordPress experts can deal with each update as it becomes accessible. We use an automated system that monitors your online availability to ensure that your website is accessible 24/7 for your visitors. If any issue occurs our engineer will instantly trace the problem and then provide a rapid solution to bring back your website online. We ensure that we provide back up for both WordPress Site and Database. In the event that you need to restore your site then we can provide it quickly. All our backups are stored on the remote servers to ensure that it is not affected if any failure occurs. With the help of our WordPress Maintenance Services East Perth you don’t have to worry any issue. You can enjoy smooth site presentation and focus running your online business. Meanwhile, your WordPress site can gain a wide traffic in search engines with the help of our SEO specialists East Perth. Also, they boost your ranking in search engines like Google, Yahoo, Bing, etc. for your visitors to find you easily. More visitors more sales! 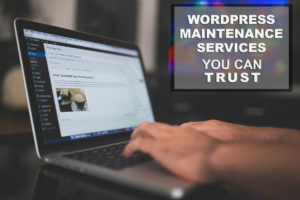 Maintain your WordPress site reliable and secure with our WordPress Maintenance Services East Perth. Contact us now. This entry was posted in Aleph IT Services and tagged best wordpress maintenance services, website maintenance support, wordpress, wordpress expert, wordpress maintenance service.